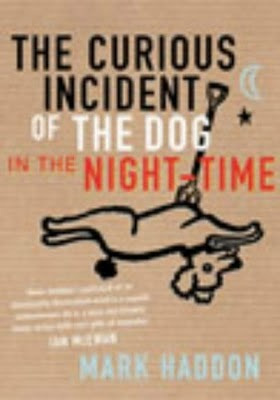 I picked up this book - The Curious Case of the dog in the night time by Mark Haddon from the library because I was somewhat intrigued to see the cover page. It thought it would be a funny and light book. But, somehow that's not exactly the case. This book will make you smile at some points but not exactly in a funny way and it will leave you pondering over it, long after you have read it! The story is narrated by Christopher Boone, who has Asperger Syndrome, a highly functional type of autism. He lives with his father in Swindon, England. He is a big fan of Sherlock Holmes. That is why when his teacher Siobhan asks him to write a book about his daily musings, he decides to write a murder mystery novel. A book in which he decides to write about the investigations of Wellington's murder and everything else he want to talk about. The story starts with Christopher discovering the dead body of Wellington, the dog of their neighbour, Mrs Shears. The dog has been killed with a garden fork and Christopher is appalled to see the dreadful condition in which the dog was lying in the garden. He decides to find out who murdered the dog and sets out to do investigation in his own way. In his quest to find the murderer and bring justice to the dog, Christopher comes across some startling secrets that his father had hidden from him. It changes his life for good. Is that all the story about in the novel? Definitely not! There is lots more to the book than just the story and plot. Haddon has very subtly given the picture of how the mind of an autistic child works. What problems the parents with such a child faces ? What are the issues that are vital to upbringing a child with special needs and lots more! The character of Christopher itself looks so real. He is very sensitive to his surroundings. He is gifted when it comes to maths and physics but, he does not understand much about human feelings and emotions like most people inflicted with this syndrome. He looks at the world in a very logical way (that is why all the chapters in his novel as prime numbered) and he wants everything to follow a routine. He does not like uncertainty and the very thought of anything uncertain makes him feel dizzy and scared. He has his own little rules to determine if a day is going to be good, very good, super good or a black day. All these little details about him makes the character so convincing. His takes on maths, physics and so many other topics will make you look at them in a new more logical way. The story is not so much about resolving the murder mystery but how Christopher decides to solve it, how he processes his findings logically during his little investigation, how he tries to overcome his fears and talks to strangers and finally how he reacts when he finds out some startling revelations about his own family. Haddon has very nicely and neatly dwelled on the feelings of an autistic child, his special needs and his understandings of the worldly things. The book is written in a very simple English and in a kind of disconnected way. But the writing style works for the story and seems more apt as it is written from the perspective of an autistic child. A must read. No wonder it won the Whitbread Book Award in 2003 and CommonWealth Writer's Prize for best First Book in 2004. I too thought it would be a light read from the cover.. it should have been different reading a novel, thru the eyes of a autism child.. will add to my to be read, so that i too can enjoy it.. BTW, have u heard of Wendy Wax. I read it so that I dont judge it by cover.. I loved the book too!! It's bitter sweet and serious and flippant at the same time.A true masterpiece! Read it a few years back and liked it. There is another book by this author - 'a spot of bother', want to read it now. I read this in 2004 and found it very interesting as I know someone with Asperger's. Have heard a lot of good things about this book! Lemme try finding it!